Paula had long been in the pursuit of a greenhouse-like space that would extend the organic growing season every year. But finding a reliable, long-lasting structure – that would also support the necessary conditions for growing healthy vegetables – proved to be a challenge. Living in the middle of farmland in Ipswich, Paula was looking for a designated and secure space to grow food. 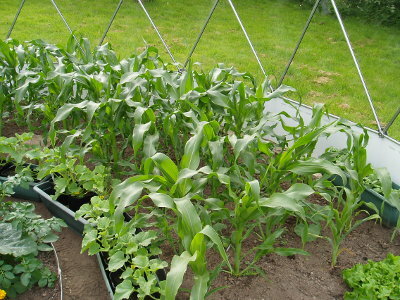 The dome is brilliant for planting seeds very early and extends the growing season. And after exploring our range, as well as visiting a glasshouse in nearby Cambridgeshire, she decided that our six-metre Retreat would provide ample room for her vegetables – while protecting them from the elements in a relatively exposed area. 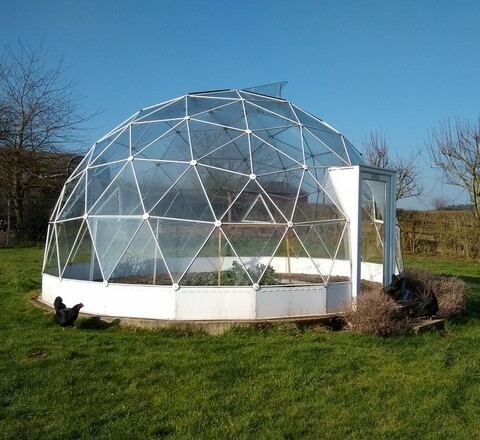 Paula spoke to Solardome Industries about the recent growing seasons and her impressive set up inside the geodesic dome. “Last year, we had sweetcorn in May – which is very early – as well as butternut squash, salads, peppers, chillies and 70 kilos of tomatoes that I processed into passata and other sauces,” said Paula. The growing environment inside the glasshouse ensured that food was being produced well beyond the spring. In fact, the organic food farming continued for the rest of the year. “I even managed to grow broad beans and some more potatoes for Christmas,” Paula exclaimed. “The fact that there are no food miles makes it all the more rewarding,” she added. To see more of our geodesic domes, check out our worldwide dome map. If you own a Solardome® geodesic dome, we’d love to hear from you! Email your pictures to marketing@solardome.co.uk or share them via our social media channels, using the hashtag #SolardomeClub. The challenge To provide a spacious, long lasting glasshouse for producing vegetables that would enable a longer growing season. Note: The cover image is a Solardome® Retreat from an alternative customer site. 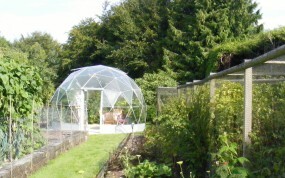 Barbara Southcott already had a polytunnel and greenhouse but was so inspired by the Solardome® glasshouse she saw at a local garden centre she decided a dome would add another dimension to her home.